For a second straight game, the Miami Hurricanes lost another heartbreaker in overtime, this time falling to N.C. State, 84-81. N.C. State freshman Julius Mays played only 11 minutes but hit the biggest shot of the game, knocking down a 3-pointer with 2.6 seconds left to give the Wolfpack (11-7, 2-4) the win. In regulation, junior Adrian Thomas gave the Hurricanes (14-6, 3-4) a 70-68 lead after he hit a 3-pointer. The Wolfpack tied it up after Brandon Costner scored on a layup. Miami had the opportunity for the final shot, but James Dews missed a last-second heave. In overtime, N.C. State started out strong but Thomas’s 3-pointer made it a 76-75 Wolfpack advantage. On the following possession, N.C. State bumped it back up to a 79-75 lead. 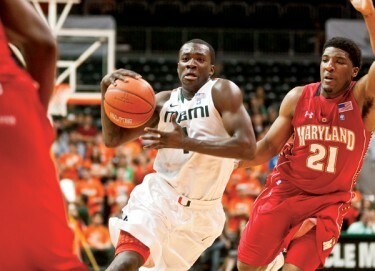 The Canes responded with a Brian Asbury 3-point play after Dwayne Collins missed two free throw attempts. Miami trailed by three with 31 seconds left, but McClinton came through in the clutch, getting fouled on a 3-point attempt. McClinton hit all three free throws to tie the game at 81. McClinton finished with 27 points, going 9-17 from the floor. But the ball rested in N.C. State’s hands and Mays hit the game winner, sealing the win. Miami trailed at halftime, 39-25, and fell behind in the second half by 19. However, the Canes didn’t quit and finally cut the lead to an eight-point deficit with 13 minutes to go. Later, a gliding lay-up by Dwayne Collins gave the Hurricanes their first lead of the game at 54-53. Collins finished with 18 points but was just 2-7 from the free throw line. Making his first career start, Thomas set career highs with 14 points and four 3-pointers. Haith acknowledges that the Hurricanes blew another opportunity to pick a win in a tough ACC. The Hurricanes will return to action this Saturday to face Maryland, a team that will remember McClinton’s late-game heroics at the BankUnited Center the last time they played.